This article first appeared on the SOS News web site, it was published in 2007 and is very relevant today. Scroll and read this article on-line or click the pdf icon to download. When the original article was prepared (2006 – 2007), SOS-NEWS had looked at the way bushfires had become big business… located and firmly entrenched at the big dollar end of town. It is amazing who was pulling this empire’s strings. The same names keep appearing behind many doors and in many capital cities. The SOS-NEWS volunteer investigators (most retired and some investigative journalists) enjoyed keeping their hand in along our intelligence gathering highway. Whistleblowers have been a great help in piecing together the jigsaw. Aviation is the latest piece of the puzzle. An aviator made contact, who had around 22,000 hours flying time, most in crop dusting, then in the early 70s he got into water bombing bushfires from fixed wing aircraft. Col Adams could see the potential of his aircraft skills. With the 2007 fire season here, Adams had one of the most self-contained and efficient aerial fire fighting services in Australia. So why had he been castigated – deprived of providing this service to the people of the state under our governments NSW Rural Fire Service – The Koperberg Empire? His highly capable early aerial response team is constantly bypassed. His services could have contained many bushfires. In one case, he had aircraft on the ground, just minutes from the fire. His airfield telephone remaining silent, as the RFS arrogantly bypassed his early response to extinguish fires quickly. An apparent personal vendetta exists from RFS Commissioner Phil Koperberg, who is obviously indifferent to protecting the environment and the public by using this crack team, with its long establish reputation for safety and perfection. Just the thought of Adams stirs him to that, “My Way or the Highway” so well known within NSW Rural Fire Service. Koperberg, the political aspirant, is an alleged $400,000 P.A salaried person with Credit Card and expense account… Under his command, the RFS bills insurance companies for around $millions + per annum. Added to this, once a “Section 44” is declared, Federal Government’s coffers are prized open harvesting millions of national taxpayer dollars to pay for NSW bushfires, we see the big dollar business of bushfires emerge. Now what may we expect from Commissioner Koperberg moving into campaign mode as a Labor candidate for the March 2007 election? He was on leave without pay from the NSW RFS, so failing at the polls for the seat of Blue Mountains – he will resume his old job. Col Adams story presents just one more piece in the jigsaw of evidence how preventable the ravages of bushfires are. The puzzle is, “just how Phillip Christian Koperberg has been able to create a vast empire that seems to run rampant with taxpayer dollars? Our story goes back to 1966, in Victoria, where Col Adams worked for one of the early pioneers in bushfire bombing. December 1972, when using a PA 25 Pawnee aircraft, Adams began utilising his experience, again pioneering further use of agricultural aircraft for bushfire water bombing. In 1974, he started promoting this form of bushfire attack in NSW – Hazelton’s were doing the same. In 1979 he decided to start his own air service company allowing more freedom to research and develop water-bombing techniques from agriculture aircraft. With accolades for his efforts in bushfire situations bestowed from government departments, looking to this form of bushfire control in both Victoria, and NSW, he became involved with testing principals and practices to further develop techniques. He received a letter in 1982 from the Department of Transport Australia, authorising licensed aerial agricultural operators to conduct aerial fire-fighting operations. Continuing development of facilities in NSW and professionally promoting this form of bushfire attack Adams was relentless. There were mixed feelings from government bureaucrats, as ministers not sure to run with this for media hype, or to just stand clear. This continued until the 1990’s. A very experienced pilot, safety conscious, and holding over 22,000 flying hours, Col Adams related his journey into hell once the idea had been kindled with the powers to be. Commissioner Phil Koperberg was there right from the start, where we see a pattern form on the empire builders ego requirement for absolute control. On the 26th May 1992, a meeting was arranged concerning aerial firebombing with the NSW Minister for Emergency Services at that time, Ted Pickering, Also attending was Phil Koperberg, along with Col Adams. Col Adams, quoted Ian Armstrong, from the Southern Weekly Magazine – page 6 published on the 16th March 1987, where he critisied the government for not taking steps to use aircraft as frontline defence against bushfires – “the monetary argument was absolute rubbish when weighing up against the value of saving lives and property” – “The success of aerial agricultural facilities at Cootamundra this year and earlier at Cudal and Orange support the need for such equipment”. 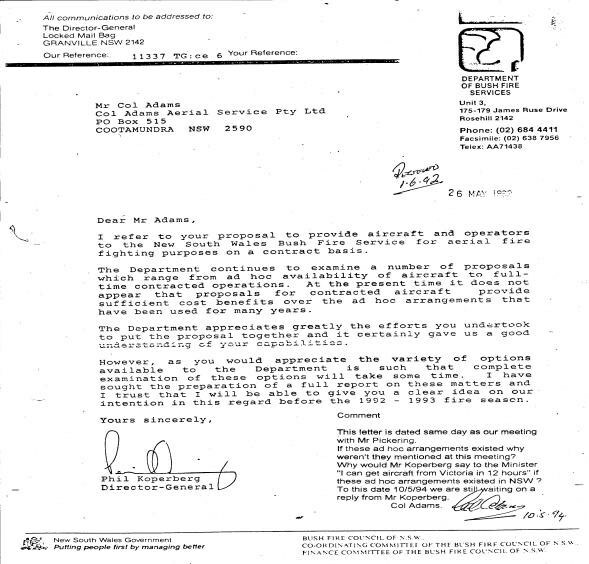 On the same day as this meeting (26th May 1992), Koperberg wrote a letter to Col Adams, (published below) which stated, “Contract aircraft proposal does not provide sufficient cost benefits over the ad-hoc (formed or done for a particular purpose only ) arrangements that have been in place for many years”. There was no mention of this at the subject meeting, nor did Adams know of any such ad-hoc arrangements. If these arrangements did exist (for years), why did Koperberg quote “I can get aircraft from Victoria with 12 hours notice” at the meeting? 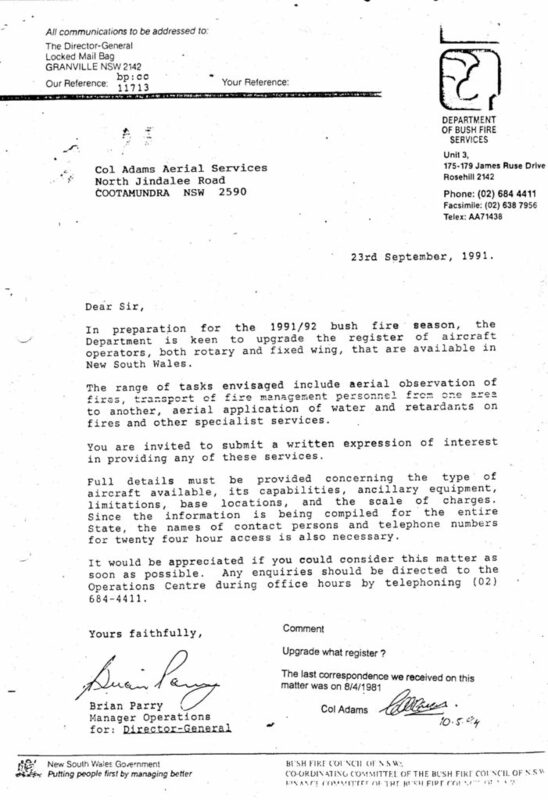 From the NSW Department of Bush Fire Services (now the NSW Rural Fires Service) on the 23rd September 1991, Col Adams received a letter from Brian Parry, Manager of Operations, stating that they are to upgrade the register of Aircraft Operators in NSW. (published below). 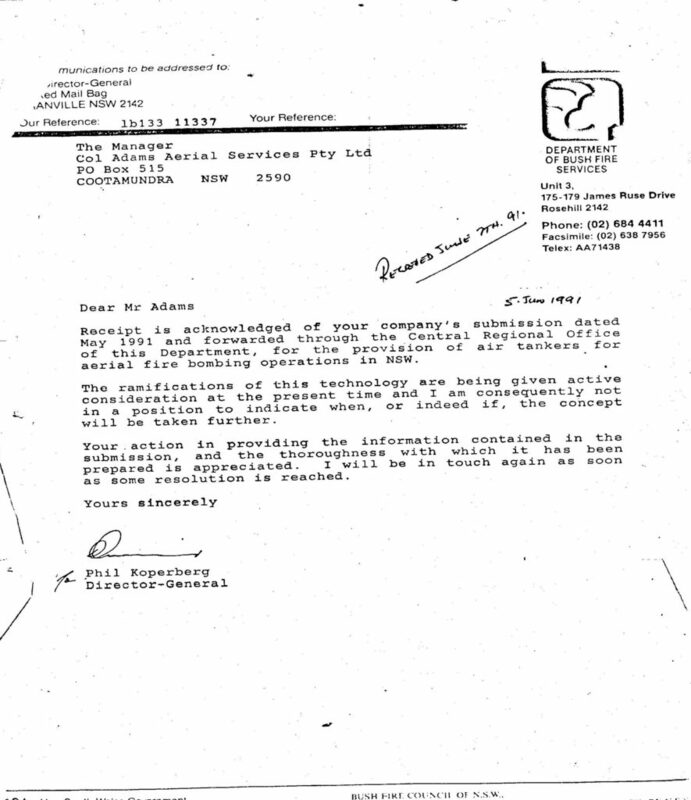 The empire was starting to build for Koperberg, but his spin was also starting to catch up when a letter was sent out on the 3rd November 1992 for expressions of interest to enter into ad-hoc arrangements. So why would an organisation with these ad-hoc arrangements already set in place “for years” suddenly need to seek expressions of interest? Here we see the level of bush fire management under full sail – apparently no idea of their situation concerning aerial water bombing in this now growing Koperberg empire now expanding into an area they obviously have little knowledge about. Bad blood has been established between Adams and Koperberg – and for many contentuous reasons. As criticisms of Koperberg at any level, being constructive, or the audacity to question his empire, is never tolerated by the Commissioner with a history of rage supported arrogance. Col Adams, a perfectionist in aviation, with knowledge dating back decades, and flying hours to support bushfire bombers concerns, would at every turn meet with this stone-wall of RFS arrogance concerning bushfire water bombing issues raised. Adams will not compromise safety, training or taking short cuts when it comes to aircraft operations. His record in the air since the 1960’s says it all – EXPERIENCE. So we move into the new millennium, November 2000. Col Adams is still attracting the wrath of Commissioner Koperberg, and now fuels this further with an issue concerning aircraft radio communications and the RFS. 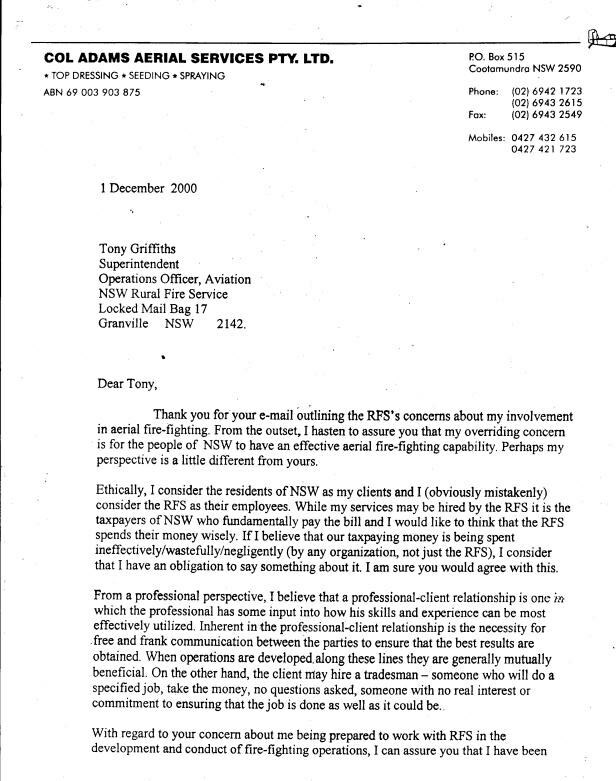 Replying by email to a phone conversation he had with Tony Griffiths, RFS Superintendent, Operations Officer, Aviation (a title from the bunker designed to draw attention) where Adams states, “he is disappointed with Griffiths attitude on the phone, plus the fact that the NSW Rural Fire Service no longer require his services”. Lets clarify Col Adams Aerial Services Pty Ltd, operating out of Cootamundra, NSW. This company is recognised in the world of aviation as providing one of the best equipped Dromader M18 aircraft in Australia, along with their OWN support team, fuel loading, retardant mixing, foam, etc, etc, all available to move to bushfire ground immediately on a phone call from RFS fire control. A totally self-contained experienced aerial bushfire quick response team that cost nothing for the RFS to have on standby – it is a pay as you use agreement. 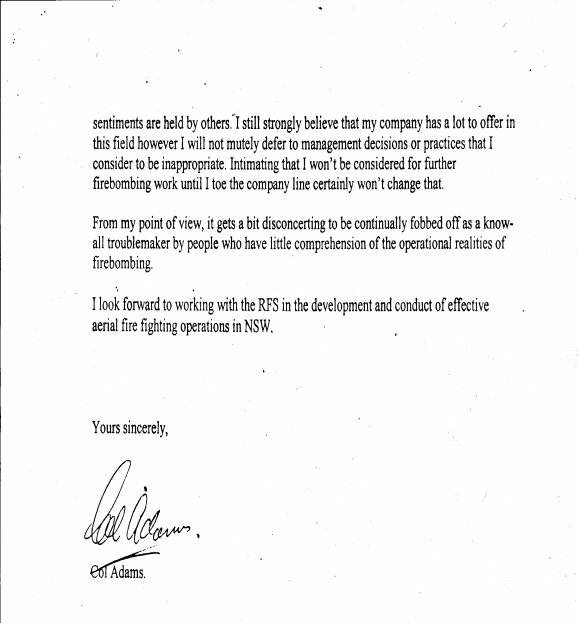 Has Adams been locked out of RFS fire bombing service because he challenged safety issues of concern? Mentioning that the radio traffic to pilots from the ground, along with other radios all running at the same time distract from the job of low flying and tree hopping, plus mountain climbing, may have triggered this trip to Coventry by the Koperberg nose out of joint rule. Further it may have rubbed salt into the wound when Adam’s objected to a contract agreement clause concerning this issue and without any satisfaction from the RFS concerning aircraft radio, consulted the State Contracts Control Board. Now we see – “My Way or the Highway” put in place. Col Adams further quoted to the RFS, “if raising important safety issues are a problem, maybe he should adopt the attitude of a helicopter pilot that said to him – just shut up and take their money”. Adams quoted: Many pilots signed contracts rather than jeopardise work, and when transceiver traffic becomes a hindrance, or a distraction to pilot flying concentration, they simply turn off offending radios. There are about six (6) individual radios fitted to these aircraft, sometimes as many as three are receiving chatter at the same time. Consider this, you are not allowed to talk on a hand held mobile telephone in a motorvehicle. Pilots of a low flying aircraft, under RFS regulation, travelling at high speed over rugged terrain needing 100% concentration, are expected to decipher, and communicate with multitudes of transmissions. Adams also refers to the NSW-RFS aviation consultant, Mr Stephen Crocker, that by his own admission said, “I don’t not know anything about fire bombing”. Contained in correspondence with RFS operations Office, Aviation, Tony Griffiths, Col Adams wrote – “in my view this put you at a real disadvantage”. Superintendent Tony Griffith’s emailed a reply to Col Adams, which states, “the RFS needs to be convinced that you are prepared to work with the service – do not be counter productive”. 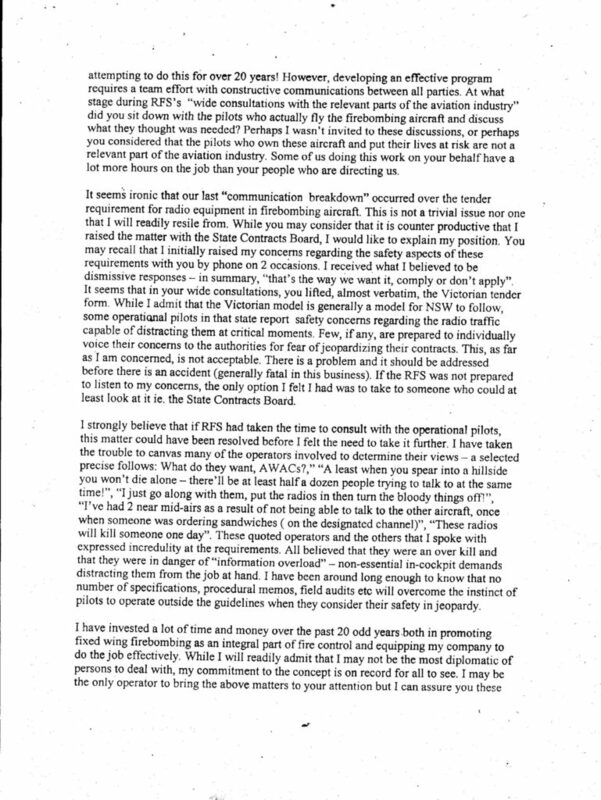 He further states total rejection that the RFS does not know what it is talking about (this phrase never mentioned by Adams) and that operators (pilots) would consider turning off the subject radios. He refers to accolades served on the RFS by the aviation regulators – he does however forget to mention the substanciated statement made by their aviation consultant that he has no idea about bushfire bombing. The RFS have failed to consult with pilots about this issue of radio traffic in the cockpit. Many interviewed pilots agree such traffic is distracting when milliseconds can mean life or death in low and mountainous flying with sharp turns and rapid climbs under power, all require 100% concentration. Radio is a safety issue – radio also can be very Unsafe in the demanding pilot environment these flying Bushfire Bombers. The following letter is from Col Adams to RFS Superintendent Tony Griffiths which sums up the situation. The whole reason for Ariel firebombing is, rapid response, keeps fires small. 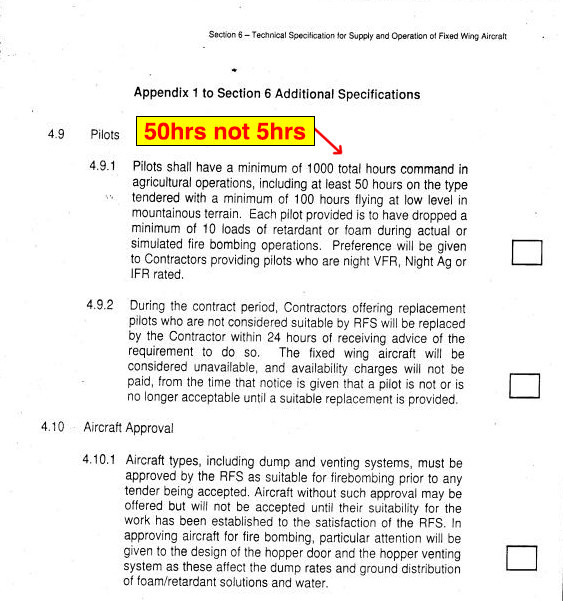 So the question asked is “Why does it take so long for aircraft to be deployed to a fire after the RFS fire controllers have been notified of an ignition”? We must ask the question “have you noted the speed which the RFS can declare a “section 44” fire at the drop of a hat”? This section sounds reasonable enough. In real terms, the Rural Fire Service can seize power similar to ASIO. Just how has this harmless sounding legislation taken away so much and done so much damage? Section 44’s are declared once small fires grow into big ones without an early all-out effort to put them out. Instead of water bombing and groundcrews to put fires out quickly, a small effort is ordered so that fires grow bigger if there is no weather change. Then, backburning and drops of incendiary devices make fires even bigger. They spread if the inevitable summer cycle of windy hotter days takes hold. A Section 44 is declared once fires reached dangerous proportions to become a wildfire. Helicopters are called in to water bomb, but not enough to put out the fires. More aircraft arrive, but never enough to quell the flames. If the flames are low, RFS Air Attack Supervisors order the helicopters to fly in later in the morning. If the fires are high and reaching dangerous proportions, the aircraft arrive earlier, but it is of course beyond their control then. More and more helicopters are ordered as the fires continue to build. A fleet of 14 with two skycranes costs insurance companies and taxpayers about one million dollars for two days. Insurance companies foot 72% of the bill having to pay a levy similar to the way we have to pay for electricity or gas. An RFS helicopter has the right to land on your property without permission and take water from dams, creeks, rivers and swimming pools. The RFS is under no obligation to replace your water, leaving many to complain that they now face financial difficulties. Two skycranes dump about an Olympic pool full in two days. RFS crews can take your vehicles, bulldoze your fences and destroy any property it deems fit. You can also be ordered to leave your property, or sit idly by as RFS crews invade to do whatever they want. Not so long ago, at Peter Spencer’s property on the NSW southern highlands, RFS intervention brought two giant fireballs in his native forest. One escaped into the neighbouring national park. According to locals, a NSW Government media release blamed Mr Spencer for the escaped fireball, saying he lit an illegal hazard reduction that went out of control. The story ran on radio and in the local newspaper according to Mr Spencer. Press statements said that Mr Spencer would be sued for the damage. a bush fire is burning in a place that is not the responsibility of any fire fighting authority. (2) The Commissioner may delegate the Commissioner’s functions under this Division (other than this power of delegation) to an officer or member of a rural fire brigade, an officer or member of New South Wales Fire Brigades, officers of the Forestry Commission, officers of the National Parks and Wildlife Service or any other person. (3) The Commissioner is not subject to the control and direction of the Bush Fire Co-ordinating Committee in exercising the Commissioner’s functions under this Division but must, in exercising those functions, take into consideration any relevant bush fire management plan and, in the case of managed land, any relevant plan of the authority responsible for the managed land of which the Commissioner is aware. Now when a Section 44 is set in place, ALL FUNDING is carried by the Federal Government. Now the Australian taxpayers are paying for the NSW bushfires turned into infernos, many from our National Parks Department who employ some public servants who PERSONALLY support greens “lock it up” myth-management, hence to build fuel massive loads feeding the infernos we have just recently witnessed. Receipts are required for all purchases by the NSW RFS and government, which they submit to support the Federal Government “open cheque book” – cost no problem. Volunteers interviewed state they enjoy the benefits as the humble sandwiches prepared by their dedicated catering staff under RFS/Government budgets, suddenly moved to chicken and all the trimmings for these “Yellow Angels”. Paid staff of the RFS, and National Parks, also benefit with overtime payments (should a bushfire pass knock off time) plus expenses. This ruffles the feathers of our UNPAID VOLUNTEERS, who form the nucleus of these fire fighting empires, and in many instances are forced to out of pockets for expenses. Is it flawed training of staff? How about a bankrupt State Government directive? State level funding is required after initial bushfire ignition is reported. A fire promptly extinguished after ignition still costs mega dollars. Now by achieving “Section 44” status of bushfire immediately transfers costs to the Federal Treasury which removes the cost burden on our very Bankrupt NSW Government. To keep the Federal vault door open, one must be seen as having the ability and resources expected of the multi-millions of dollars poured into “Section 44” fires. Such a display was orchestrated on graziers properties at Junee, on January 3rd 2006, after bushfires had ravaged the area on New Years Day, January 1st. Three fixed wing aircraft, one being from Col Adams, were instructed by the NSW RFS to “Paint Lines” for the pending visit to the fire area by Deputy Prime Minister, Mark Vaile (Nationals). Local farmers confirm that fire retardant had been spread on the fire ground WELL AFTER THE FIRE HAD BEEN EXTINGUISHED. Remember this area was under a bushfire stamped “Section 44”, so owners permission of this being spread on their grazing land was not required, the RFS had the power – accountable to NO-ONE. Col Adams fire bomber, flown by his son Scott, spreading fire retardant on the Junee ground under instruction from the RFS as a façade feed to the Deputy Prime Minister. WHO PAID FOR THIS? This façade firebombing continued for around 7 hours resulting with a line of Phoscheck (brand of retardant loaded with a red dye) stretching about 1 kilometre. After the fire had been contained, Tuesday morning Col Adams, along with other pilots involved with containment of that bushfire, attended a briefing by the RFS. They were informed that, “the Deputy Prime Minister, Deputy Premier and Koperberg were coming down and they needed some red lines around the country side”. This meant they wanted retardant lines that have a red dye to see where it has been dropped spread on the ground and tree tops – for the benefit of the pending visitors. Col Adams later spoke with RFS people who said they were present when Joe Knox (RFS Wagga ) took the call from RFS Headquarters in Homebush and was ordered to put out the red line. Our inquires (SO FAR) reveal that Joe is being left holding the baby so to speak, as the gutless perpetrators of this façade cringe in a corner. But you may rest assured we know who sanctioned this along with ALL the players. We just require the finishing statements, etc, and will have the truth on this published in our weekly news and website very soon. To conduct such a stupid operation, placing pilots lives at risk, knowing the fire bombing business is extremely dangerous, all this to paint the ground for pollies is just unforgivable. 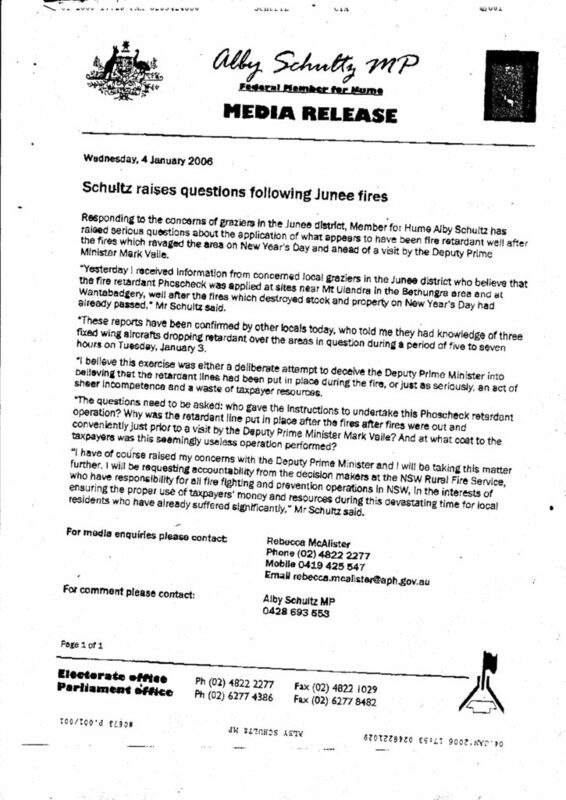 “I believe this exercise was either a deliberate attempt to deceive the Deputy Prime Minister into believing that the retardant lines had been put in place during the fires, or just as seriously, an act of sheer incompetence and a waist of taxpayer’s resources”, was mentioned in a Media Release dated 4th January, 2006, by Federal member for Hume, Alby Schultz MP. WHO gave instructions to undertake this Phoscheck operation? WHY were the retardant lines put in place after the fires were out? WHAT cost to the taxpayer was the seemingly useless operation performed? The Homebush Bunker went into damage control with Koperberg’s well-oiled whitewash spin set in motion. Venting his anger personally with Federal MP Mr Alby Schultz for raising the issue, which we have revealed under a “Section 44” and Federal Government funded, Mr Shultz had every right to question Koperberg’s actions as Commissioner of the NSW RFS. Again we see the anger and arrogance, reflecting the shallow depth, and predictable outbursts expected from Commissioner Koperberg. Unanswered still, is an RFS official explanation. As Koperberg creeps away from the RFS empire Bunker he treasures to develop his spin skills further as the labor candidate for the NSW Blue Mountains, he is hedging his bets. Phil is only on leave without pay from the RFS until March 23rd being “DDAY”, but still the RFS bunker mentality remains. Being refused Bushfire Bombing secondment, because of Commissioner Koperberg’s personal dislike of Adams, Col was delivered further spin by Chief Superintendent, Maryanne Carmichael (a Loyal Koperberg Lieutenant). Adams, on the 21st March, 2003, presented his concern that on advice received on the M-18 aircraft being fitted with Delta Turbine Conversion engines, they were illegal. Further, they are being flown above the manufactures certified fire fighting overload weight while in excess of it’s VNE (MAX never to exceed speed). Col Adams is to this day still locked out of the RFS Bushfire Bombers loop providing to the citizens one of the most efficient fire bombing operations in Australia. To view the official original report we have published below – visit this website. While conducting fire suppression operations on a bushfire in the vicinity of Mount Ulandra near Bethungra NSW, the turbine-engine M-18A Dromader collided with the ground. The aircraft was destroyed and the pilot, who was the only occupant, was fatally injured. A turbine-engined PZL-Warszawa-Okecie M-18A Dromader aircraft, registered VHFVF (callsign Bomber 223), was conducting fire suppression operations on a bushfire in the vicinity of Mount Ulandra, near Bethungra, NSW. At 1921 Eastern Daylight- saving Time, the aircraft was seen by fire fighters to make a low pass over the fire ground area and commence a left turn. Another fireman reported seeing the aircraft in an almost vertical left bank before losing sight of it. None of the other firemen continued to watch the aircraft but, moments later, they reported that they heard a loud noise. When they looked again, the aircraft had hit the ground. 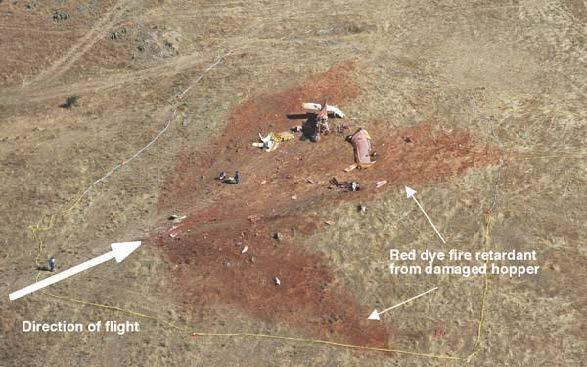 The pilot was fatally injured and the aircraft was destroyed by impact forces. There was no fire. The crew of a helicopter engaged in fire bucket operations on the same fire ground reported hearing the Dromader pilot broadcast that he was ‘lining up for a drop’. A short time later, the helicopter crew reported that they heard the pilot transmit three short expletives. After unsuccessfully attempting to contact the pilot, they commenced searching and located the wreckage of the aircraft a few minutes later, where fire fighters were already in attendance. The aircraft had impacted open, rising terrain in a nose-down, slightly right wing-low attitude. Examination of the impact marks and the wreckage indicated that the aircraft had been travelling at low forward speed and with a high rate of descent. The ground around the wreckage was covered with a considerable amount of chemical retardant from the ruptured hopper (pictured below). The aircraft was manufactured in Poland in 1988 and placed on the Australian register in March 1999. In November 2003, the aircraft was modified from the original design in accordance with an approved Supplemental Type Certificate (STC), number SA09039SC, which permitted the replacement of the original reciprocating (radial) engine and the 4-blade propeller with a Garrett TPE 331-12U gas turbine engine and a Hartzell 5-blade constant speed propeller. The modification also incorporated other changes that included the replacement of the hopper with a larger, 800 US gallon (3,030 L) hopper (see Notes No 1). Additionally, servo tabs were added to the primary flight control surfaces, flap travel was increased and vortex generators were installed on the wings and tailplane. The aircraft was operated in the restricted category 1 that permitted flight at weights up to 5,300 kg during agricultural operations, which was 1,100 kg in excess of the certified maximum aircraft we ight. 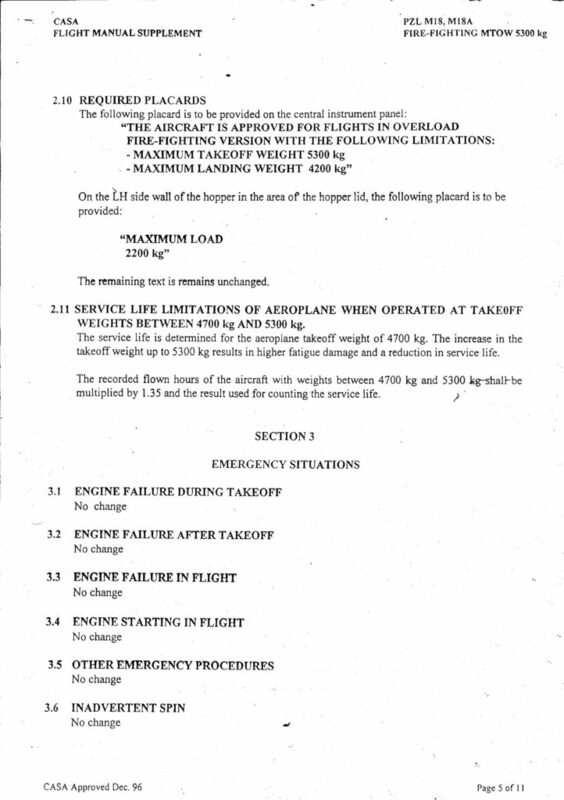 Flights at those weights restricted the aircraft’s maximum speed and, during fire suppression operations, manoeuvring was limited to a maximum angle of bank of 30 degrees (see Note No 2). The pilot held a commercial pilot licence, endorsed for the aircraft type, and a valid Class 1 medical certificate. The pilot also held a Grade 1 Agricultural Rating and had been issued a Night Visual Flight Rules Agricultural Rating on 19 December 2004. The test for that rating met the requirements of the Aeroplane Flight Review, the biennial proficiency check required of pilots. The pilot had in excess of 4,000 hours in agricultural flying operations, of which 127 hours were flown in fire suppression operations over a period of six seasons. Although the pilot had only 4.7 hours on the aircraft type (See Note No 3), he had flown over 400 hours on the unmodified radial-engine Dromader aircraft type, and had over 600 hours on other turbine-powered aircraft. The pilot had commenced fire bombing operations two days before and was reported to have been well rested and in good health. an appraisal of flight characteristics of the modified aircraft during operations at higher gross weights. No1 – The Aircraft flight manual states “Maximum hopper weight = 2200 KG – the hopper expansion to 3030 litres capacity is for bulk only eg: Rice/Urea based fertiliser,etc. No2 – According to RFS Airbase Operators, the Turbine M18 Dromanders are carrying 2800 litres of retardant calculated @1.1 = 3080 kg in weight, or 3000 litres of foam which calculates out to 1930 kg above the aircraft manufacturers certified maximum weight. The CASA approved flight manual lists a placard be placed on the instrument panel of the aircraft stating MAX LOAD for landing an takeoff – (see 2.10 below). It further instructs that on theL/H side of the hopper lid (where the water or retardant is loaded into the aircraft) of 2200KG MAX LOAD. Now 1.35 shall be the multiplier used to count the service life of the aircraft carrying weights of 4700kg – 5300kg. = (see 2.11 below). This tragic death of a young family man is not a platform to mount findings of the presented information we have tendered. It is however government standards of historic substantiation when involved with damning evidence to utilise the public purse. This ploy is monotonously implemented, funding lawyers to adjust factual substantiated tendered evidence through the lucrative fee harvesting legal system, utilising suppression tactics, along with engineered due process stalling ploys loaded with massive cost factoring modules to smother surfacing truth from under funded opposition unable to join any legal challenge. Recently, I refer to the Coroner Doogan inquiry into the 2003 holocaust bushfire that near destroyed Canberra, along with some 500 homes, with loss of life, where we saw the ACT government take Doogan to the nation’s courts quoting bias in her unravelling of sensitive facts that were pungent to the political nose of great concern to maintain survival at any cost to you the taxpayer. The whole publicly funded legal challenge was dismissed, Maria Doogan resumed, and in processing her report confirming bungling and mismanagement from bureaucrats and government alliance joined by the well funded bushfire empires. All still operate as totem poles of authority employing flawed political umbrella’s of deceitful myth-management awaiting our next bushfire disaster. Col Adams relates to the depth that an empire will stoop to maintain power and control under government sanction, funded by the taxpayer, that has been overseeing bushfire infernos that we have rarely experience in past decades, now an annual events. Just after the January 2006, Junee fires, another fire stated around Wagga Wagga. Col Adams knew nothing at the time of this fire raging on 20,000 acres. It was just 20 minutes away from his base at Cootamundra, the RFS never contacted his team. March 2006 another seven (7) fires on about 1,000 acres of area and just 15 kilometres from Col Adams airfield, again Col had not been contacted by the RFS, being the closest air bombing service to the fire. After 2 hours other aircraft arrived and extinguished the fire, then kept bombing well after it was out, in what can only be perceived from a public perception point, as an action to pad up the invoice presented to the RFS for services rendered. There is approximately six companies in NSW supplying aerial Bushfire Bomber services and about half of those are on contract with the RFS. Col Adams is content with the on-call arrangement in lieu of a contract, which allows him freedom to service his rural clients as well as maintaining his deployment team to bushfire grounds at a minutes notice. To consider that Philip Christian Koperberg, with your money, with your lands under bushfire threat, and a despotic arrogance that has an organisation purported to be the NSW arm to bushfire control on it’s knees in homage to him, is a public disgrace. The evidence pile expands daily from the Koperberg Empire controlled by an act of the NSW Parliament, but where is the accountability? Let us walk along another arm of the Koperberg tentacles that extend into Victoria around the Suburb of East Melbourne. As we have covered previously, the NSW – RFS took years to get organised with aerial fire bombing, even after the major work of testing and implementing had been done in Victoria. If you have not gathered by now, then let me enlighten you. One of the largest businesses in Australia today is “Bushfires”, where experience counts on many levels. From factual hands on experience, to the projected façade of the experienced salesmen it is big bucks. The Victorian Country Fire Authority is a government/insurance-funded organisation with well entrenched Chairman, Raymond Leonard Foster. Foster stems from a good education, a lawyer, featuring around the boardroom circuit of Victoria. Koperberg is his NSW opposite number at the NSW Rural Fire Service, accredited with a chest full of medals, a uniform, and a streetwise ability to survive. The bushfire business host these two names on many organisations if you care to surf the web at anytime. Our wonderful team of volunteer investigators have worked tirelessly for over 12 months on this massive bushfire business so that we may bring to you information gleaned. Just what is going on in the multi-millions of taxpayer dollar funded organisations? Who is allowing these empires to grow and flourish while controlled media suppress the information, and government continue whitewashing. We obtained documents from ASIC (Australian Securities & Investments Commission) that state NAFC was registered on 4th March 2004 and started business 11th August 2003. The two directors mentioned (2007) as the principals, one being Philip Christian KOPERBERG born 28th April 1943, Amsterdam, Netherlands who is the Commissioner of the NSW Rural Fire Service and the other being Raymond Leonard FOSTER (Len Foster) Chairman of the Victorian Country Fire Authority (among many other bodied and companies) and both are directors of the Bushfire CRC Limited that just happens to be registered at the same address as the NAFC in East Melbourne. Being set-up to supply aircraft to the States and Territories bushfire services as a single point of contact and deployment make both of these people (KOPERBERG and FOSTER – 2007) appropriate within this organisation. From the following you may form your own opinion of this small part of the whole story our volunteer investigative journalists have presented. In 2003 after the ACT bushfire, Len Foster (who is a solicitor among other hats he wears) chairman of the CFA, tendered a submission to the Federal government to establish a national aerial fire-fighting organisation to deploy fire-fighting aircraft to bushfires around the nation that would be suitable for the requirements of individual fires and areas. He further suggested that this should not be a government controlled department, or body and that it be privatised to allow flexibility, etc, etc. The timing was perfect, receiving the green light as government had the Snowy/ACT fire hanging over their heads and needed to look in the public eyes as if they were doing something. Ian Campbell MP announced funding of $16.5 million for the National Aerial Fire Fighting Centre ($5.5 million per annum for the three years 2004-05 to 2006-07). Now they are all cashed up and no government interference in the running of this very private public company that is listed as a charity. Let us not forget the big dollar contributions states and territories make to NAFC hiring aerial bushfire fighting services over and above the Federal cash cow. Again ASIC provided more information, along with a copy of the NAFC registered constitution, but alas, the financial auditors report had not been submitted at this time and not being a board member, we the people are not privy to the figures. Eligible Members: All Australian States and Territories (under schedule 3) an application to join the NAFC is made in the form the board prescribes. All applications are considered by the board who in their absolute discretion. It also makes provision for any entity, which the board considers a benefit to the Company. Now under section 5, it states that all income must be applied solely towards the promotion of the objects of the Company and no portion of it may be paid or transferred to members. It does however under section 5.3 allow members, officers, employees of the company, in return for any services rendered to the Company. The office of Secretary will at ALL times be performed by the person who is the current Chief Executive Officer of the AFAC (Australian Fire Authority Council). Tony Blanks (Member) – Forestry Tasmania. The CEO is none other that Len Foster. Because we do not have any in-depth copy of an account auditing, we are unable to glean what and whom may have been paid in accordance with these company’s constitutions. Under section 18 it allows any director with a contract or interest with the Company (NAFC) are not liable to account to the Company for any profit realised ….. So with the books kept close to the chest within this private/public Company, but it is only opened to the Board of Directors – your guess is a good as any – but we may have more on this later as the rope is sure to tighten. An interesting section is the provision in 8.4 – The non-receipt of a notice by or the accidental omission to give a notice to any of the members of any General Meeting will not invalidate any resolution passed at that meeting. Now what a tool to maintain control should disenchantment of the running of the Company be under question from concerned members who have no recourse. Senator O’BRIEN: It recommends in 8.6 that the Commonwealth maintain leadership of support for the National Aerial Fire-fighting Centre for a further three years until the bushfire cooperative research centre has finalised its research into the effectiveness of aerial suppression operations. Where are we on that and what is the department’s role? Mr Doherty: Our role is to administer the funding as a contribution. 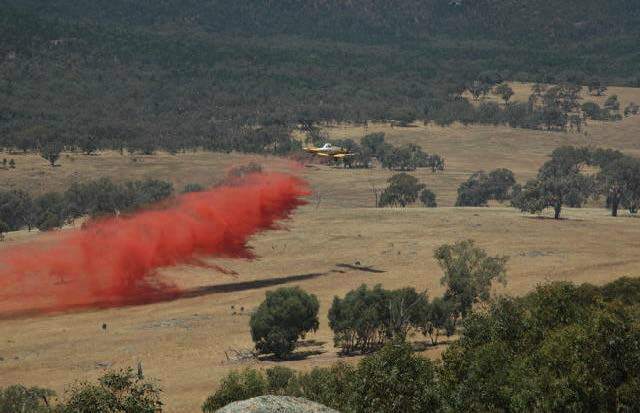 The terms of the recommendation have been met in that funding has been allocated for the next three financial years at $5.5 million a year to support the National Aerial Fire-fighting Centre. Again, by the nature of the recommendation, it looks forward to further work by the bushfire CRC. There will be further thinking about aerial fire-fighting approaches down the track. Who is on the board of the Bushfire CRC – and the “Cash Cow Government” are awaiting recommendations from WHOM? Our lengthy inquiry has opened avenues that required a dedicated database to contain the paper trails and whistleblower information, not mentioning inside contacts, which now require a full blown flow chart construction that is being undertaken by an off-shore volunteer who is now custodian of our only copy of the database. From this curtain raiser we have published you may glean what may be a government funded junket that is accountable only to themselves and auditors they appoint, and it would seem that the initial auditors have already been replaced according to ASIC data. There are many companies registered to the Albert Street, East Melbourne address, all Bushfire related and operate out of the same office as NAFC. The same names keep appearing on the list of CEO’s and Directors of bushfire related Companies who feed off State and Federal funding in the MILLIONS of $$$$. Should we dare to ask “has the government looked at the books as keepers of the public purse – being our tax and donated dollars”? It further seems that to appease the public concern with the bushfire infernos being out of control all over the nation, fuelled by bureaucratic bungling and government myth-management, these non-monitored millions are funding air-shows to media, used for front page hype to appease their government masters while the millions of bucks fade away from view. Form your own opinion from these few facts as to what the big picture will turn up and I hope to bring it in graphic detail to your attention. Years of experience tells that government inquiries only start if the outcome is known first. Law Enforcement department heads are there to appease their bosses, the government – but our desire here is to reveal the whole story from evidence gathered over the past 12 months which is undoubtedly terrifying government, that you the people will have information they wish to remain concealed. To those who think removing or disguising accessible data – the best time to do that was “Last year”. Mr ********-Yes, I shall. I believe the federal government in itself has dropped the ball. It has dropped the ball because there is no federal agency or part of the federal government that takes an interest in the bushfire situation in Australia. I was at the Bureau of Meteorology head office; I had nobody to talk to at the Commonwealth government level. Interest from overseas would come in. It would come in probably to the Department of Prime Minister and Cabinet. It would go to CSIRO, who would declare the national policy. Now it comes in and it goes to the Australian Fire Authority Council. There are two individuals in Australia-who I call the Murdoch and Packer of the fire situation-who now, behind the scenes, have almost total control of the whole situation. The federal government has got to establish high quality interest in this area. Thank you. CHAIR-Do you want to name the two people? CHAIR-You are protected by parliamentary privilege. Mr ********-Mr Koperberg and Mr Len Foster. As CEO of AFAC he has been instrumental in increasing its influence and standing as a national peak body. AFAC is now recognised by Federal Government, other peak bodies and private companies as being able to bring a co-ordinated, agreed national position to most issues quickly and effectively. If this is the case, why are the Eastern States of Australia having its public lands incinerated? And please do not tell us it’s the drought. Bushfire inferno proportions presented on a regular basis, not previously encountered in NSW history since these public accoladed experts were set in place. There is an alternative for NSW Volunteers dissatisfied with Rural Fire Service who is dead in the water without you, yet dictates control of your RFS- Association (RFSA),….. just, “SHIFT CAMP”. Considering that it has taken until 1995 in NSW for aircraft water bombing of bushfires to get established – when all other states have been operating aircraft fire control decades before – this reflects on both government and the previous bushfire management, the Department of Bushfire Services, also run by Mr Koperberg. No empire is complete without a military band ….Phil has that Brass Band, featured on a recent Rural Fires service Association magazine in all their glory. There may be a slim chance that from a balcony overlooking the masses you may see Phil back in uniform, slipping from behind curtains to take the salute – but only if people of the Blue Mountains inadvertently vote him into office. Listen to the interview recorded by SOS-NEWS between Col Adams and Editor Mal Davies. The VFFA is very pleased to see that the NSW State Government has created separate Police and Emergency Services portfolios and we would like to congratulate the two Ministers as they embark upon the management of their respective roles. ← What are you doing with all that money?